Ainos Ponies are an incredibly rare breed of pony found only on the western Greek island of Kefalonia in the Gulf of Pátras. Unfortunately, tourism, poaching, and the lack of grazing land threaten them and their numbers shrink every year. 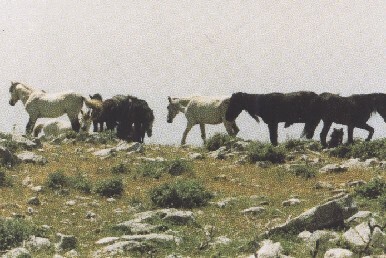 Ainos Ponies are descendants of Pindos Ponies and they were originally used as pack animals or transport in the mountains. Today they live wild on the slopes of Mount Ainos. While there have been some attempts to create breeding programs for Ainos Ponies, there is very little local support. They are on average height 11.3 - 13 hands tall. They have a large head, a short thick nexk, steep shoulders, and a compact body. Their legs and feet are strong but their joints can be weak and they are prone to sickled hind legs. They are usually dun or brown.